There is no shortage of books about diabetes or books about fitness, and no scarcity of books that chronicle the accomplishments and life stories of athletes who have overcome obstacles to achieve stardom. But a book that combines all three is rare - if not nonexistent, until now. "You are such an inspiring person! You have put forth a great, but simple plan for those of us who are looking to live healthy and fit. It really is easy to do, and it makes such a difference in how I feel, both physically and in my self-confidence. Thank you!" "Doug: I found your story to very inspiring and appreciate your efforts in setting an example for the diabetic community to follow. Keep up the great work and inspiration...it's greatly appreciated and desperately needed." "Since childhood, I have been a great fan of Arnold, and now at the age of 32 I have a new inspiring model - YOU. Thanks!" The Diabetes Antidote is both the story of Doug Burns - a scrawny 7-year-old when his Type 1 diabetes was diagnosed but in adulthood became the Natural Mr. Universe - and Doug's compelling advice for preventing Type 2 diabetes and reducing the ill effects of Type 1 or Type 2 by becoming and staying physically fit. Written by Burns with Denny Dressman, this book is unique in the way it weaves practical instruction and first-hand knowledge together with Doug's personal experiences as a childhood "bag of bones" who ignored his doctor's advice to refrain from weight training and used exercise and physical fitness to improve his health. This personalized context makes The Diabetes Antidote more engaging than the typical fitness guide or medical advice book. Doug's own success establishes the credibility of the approach he recommends. "Consistent and effective exercise coupled with intelligent weight loss and eating right can reverse the Type 2 condition in many people, as well as prevent it in almost all." Doug's accomplishments are nothing short of amazing. Despite his diabetes, he became a record-setting strength athlete, with American records in several weightlifting categories; a championship physique competitor, with Mr. USA and Mr. Universe among his bodybuilding titles; and a respected personal fitness trainer, whose clients include Olympic athletes and professional football players. 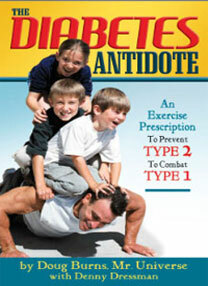 The Diabetes Antidote explains how and why exercise and physical fitness are so effective in combating diabetes, and offers a proven "exercise prescription" that doesn't require exceptional strength, unusual athletic ability or mastery of intricate exercise technique, and which anyone - man or woman, child or adult - can follow. The Diabetes Antidote's greatest value may well be in what it offers those millions of people who haven't yet developed Type 2 diabetes but are headed in that direction. Doug's "exercise prescription" truly can be an antidote to the development of this lifestyle-induced condition. "This compact book packs a powerhouse of lifesaving information. It would be great if it could get into the hands of the people who need it the most... each diabetes patient." This compact book packs a powerhouse of lifesaving information. As a fitness instructor myself, I agree wholeheartedly with the author's ideas. I especially liked the "exercise and diet" vs. "diet and exercise" idea. It would be great if this book could get into the hands of the people who need it the most. Perhaps some creative funding ideas could be explored such that doctors could give a copy of the book to each diabetes patient. "This little book from Mr. Big Type 1 is like a field guide to gettin' your diabetic head in the game. It tells the story of how a scrawny kid diagnosed with diabetes at age 7 morphed himself into an award-winning body-builder. And in between the snippets of his story, we get a lot of empowering messages about the indispensable effects of exercise and how important it is to 'just do it.'" It's only 110 pages. I read it on the plane on the way home from St. Louis. It's an "exercise prescription" to prevent Type 2 and combat Type 1 diabetes. It's The Diabetes Antidote from Mr. Natural Universe Doug Burns, with Denny Dressman (he's the journalist who helped NFL star Jay Leeuwenberg write Yes I Can! Yes You Can! -- a review for another day). Now I'll be darned. Can you believe that when I mentioned my workout regime to my first diabetes educator a few years ago, she actually said, "Well, as a Type 1, you can exercise till the cows come home, and it won't change your diabetes." Hah, I just knew that couldn't be right. Vindicated!! "None of us may be in training for Mr. Universe, but this is a good book to motivate young people with diabetes or adults who allow their fears to stymie their ability to control this life-threatening disease." Review by Bonnie Sanders Polin, Ph.D.
Mr. Burns' history with diabetes reads like a horror story of extremely high blood glucose levels, failure to thrive, being bullied, and difficulties with school and self image. His answer, which certainly seems to have worked for him, is exercise. Surprised? Of course you're not, because we talk about the value of exercise for both type 1 and type 2 diabetes. What I like about the author's style is that he is forthright - that is, he pulls no punches. He tells you to empower yourself and then gives examples of how he works with clients to change their understanding of diabetes and how to control the disease. I have a few problems with the way he presents his antidote. For example in chapter 5 he states "It's about exercise, first, and then diet". As someone who writes this web site and books about diabetes, I would not have made this glittering generality. However, in 4 pages, Mr. Burns redeems himself by saying, "Obviously, the ideal scenario is to combine both. To do the most for your health, you must combine the activities you like with good eating." Another thing I particularly like about this small rewarding book is the author's assault on magic answers. He knows that making the decision to take control of one's life and set reasonable goals is the true magic of self preservation and controlling diabetes and its long- and short-term complications. His honesty about the complexity of diabetes and descriptions of his own hypo and hyperglycemic events gives insight for those without diabetes about what we, who do, live with. I must say, I read his idea of how to eat during the day when trying to control blood glucose levels with interest and will do medical research on how this would work for people like us who are not in training. (Although I work out 6 days a week, it certainly would not come anywhere near what he describes in the book.) His formula is: "Eat breakfast like a king, lunch like a prince, and dinner like a pauper. And drop your carbohydrate intake at dinner." In the last chapter, the author answers questions that are most frequently asked when he lectures. Although, I liked reading the entire book, this was my favorite chapter because the information was concise and to the point. None of us may be in training for Mr. Universe, but this is a good book to motivate young people with diabetes or adults who allow their fears to stymie their ability to control this life threatening disease. It's a quick read that says 'Yes you can'." OnTrack Diabetes Health Updates brings the latest in medical treatment and research results on diabetes and its complications. OnTrack Diabetes offers recipes, menus, medical updates, entertaining, travel - practical information to enhance life while managing diabetes on a daily basis. "Doug brings the wisdom of living well with type 1 diabetes, and his years of working as a personal trainer, to the task of helping to motivate people to take a more active role in their health." It's no secret that exercise is an important part of living a healthy life, and that exercise is especially important for people with diabetes. Doug Burns, who was diagnosed with type 1 diabetes when he was seven years old, shares his experiences with exercise -- in particular, weight lifting and body building -- and offers suggestions for making physical fitness a part of your life. Doug brings the wisdom of living well with type 1 diabetes, and his years of working as a personal trainer, to the task of helping to motivate people to take a more active role in their health. The Diabetes Antidote is easy to read and may be just what you need to make the commitment to making exercise and physical fitness a part of your life. Debunks the notions fad diets, weight-loss supplements and the latest exotic new gadgets are the solutions to diabetes management and prevention. Each chapter is introduced with a key thought from the chapter. BY ANDREA L. HAYES, M.D. OUR SOCIETY IS experiencing a devastating epidemic. Almost 70 percent of our population is now considered overweight or obese, contributing to the 8 percent of Americans who now have diabetes. It is estimated that 12,000,000 Americans are diagnosed with diabetes; another 6,000,000 remain undiagnosed. Unlike potentially lethal infectious disease epidemics in our country's history, there is no known pharmaceutical cure for this disease of our times. Nor will there be one in our foreseeable future. Although the prognosis, at first thought, bodes bleak, in fact the most effective medical treatment lies within the power of each individual. This treatment does not cost hundreds of dollars monthly; actually, it is free and available to everyone. What is this magic secret? You will find out in this book. As an endocrinologist, I and my health care team treat thousands of patients with chronic medical problems related to unhealthy lifestyles, a poor diet and lack of appropriate physical activity. We write hundreds of prescriptions aimed at improving such common conditions as diabetes, high cholesterol, high blood pressure and others that may eventually lead to the leading killer in our country: heart disease. Insurance companies reluctantly pay for some of these expensive medicines; our insurers rarely fund preventive therapies. While that's the bad news stated, the good news is stated within the pages of The Diabetes Antidote. We all have the ability to make lifestyle choices, including what types and quantities of energy we consume and the energy that we expend through activity every day. What you will find in this book is a straightforward approach to health improvement delivered with passion and practicality. I have seen many patients become the victims of their own circumstances in living with diabetes, which unfortunately leads to devastating complications if this disease remains uncontrolled. Doug and Denny's approach is to educate, motivate and inspire their readers. Occasionally I meet someone who asks me the question, "Do you suffer with diabetes?" They really mean, "Do you 'have' diabetes?" as if everyone who carries this diagnosis suffers. My resounding answer is always an emphatic "NO"! Living with diabetes does not guarantee suffering any more than buying a treadmill guarantees fitness. Take a look at Doug Burns, Mr. Universe, and you will not see a picture of a man who suffers! The field of diabetes has exploded over the last few years and offers us more tools than ever to treat this epidemic. We have new and improved blood glucose meters, insulin pumps, blood glucose sensors, and designer insulins, as well as a plethora of pills targeted at insulin resistance, insulin deficiency, and the body's disposal of glucose once it is ingested. We sometimes find ourselves giving patients hundreds of units of insulin per day, only to find out that some individuals can "out-eat" even the most sophisticated of insulin regimes! Alternatively, caloric restriction can dramatically reduce insulin needs by improving insulin resistance in a matter of only a few days!! We now have oral agents specifically designed to reduce insulin resistance. One side effect however is WEIGHT GAIN, of all things! So, as a health care provider, I find myself frustrated in achieving the results that I strive so vigorously to achieve. It is my hope that The Diabetes Antidote gives you the tools, the knowledge and the motivation that are required to achieve a sense of empowerment for your health. You will be inspired by the obstacles that Doug overcame, starting at a young age with the diagnosis of diabetes. You will see that anything is possible if one keeps the vision and the faith. Set your goals and keep focused on the inspiration that you read through these pages. The rewards and pride that you will achieve will be greater than you could ever imagine. The Diabetes Antidote concludes with answers to the questions Doug most often receives from the audiences at his presentations on fitness and diabetes. Here's a sample, followed by all of the other questions Doug answers in Chapter 10. QUESTION: I've been trying to lose weight for a long time. I go to the gym twice a week and walk some, too, but haven't lost any weight. Is there something wrong with me? ANSWER: There are two ways I can answer this question. Both begin with, "No, there's nothing wrong with you." One answer is that you must stop "trying" to lose weight. Instead, make a commitment, and get it done. If you were five-feet-eight and weighed 250 pounds, and I offered you $17,000,000 to lose 100 pounds in eight months, you would find a way. The key is to set your own goals, and make them a reality. You must address the "need" to get the job done, and remind yourself on a daily basis. You can do it. Calories out equals the amount of energy you expend with the activity in which you engage, plus the number of calories your body burns while at rest, which is your Basal Metabolic Rate or BMR. Exercise moves your BMR to a higher level than anything else can. Inactivity — and inadequate activity — trains your body to send calories to the fat cells. It slows your metabolism and tells your body you don't need the energy for fuel, so, in effect, "please store it" (as fat). If you had 90 flights of stairs at work, and you had to climb them every day, you'd see a change in the way your body processes food fairly quickly. If I have diabetes, can I benefit from exercise without losing weight? Do you let yourself start your workouts with blood glucose that's higher than you would normally maintain? When you feel a low coming on during a training session, what do you do? How do you exercise if you've had a rough day with blood sugars? Is there a danger in doing that (forging ahead)? Does it affect your ability to do your workout? Do you just leave it all to the pump while you're training, just trust the pump to control yourself? Do you have to take it off while you're lifting weights? Are you testing your sugar at the beginning and during your workouts? How do you keep track of how you're doing? With the way you train and with your diabetes, are you more prone to highs or lows? Isn't lifting weights dangerous if you are an older person like me? Can your diet work for anyone, or must they be into weightlifting, bodybuilding, or competitive sports?